The Philippine national rugby union team, nicknamed the "Volcanoes" represents the Philippines in international rugby union. The Philippines have yet to make their debut at the Rugby World Cup, but have been playing in the Asian 5 Nations tournaments since its inception in 2008. Currently they are the reigning Division I champions and are promoted to the top 5 for the 2013 tournament. In the March 19, 2012 IRB World Rankings, Philippines, along with Mexico and Pakistan, were listed for the first time, entering with the base rating of 40 points (which positioned the three national teams in 71st place). In the April 16, 2012 IRB World Rankings, the Philippines ranked 62, their highest rank ever since the team was created. With their unbeaten record in the latest Asian 5 Nations Division I tournament, and promotion to the Asian 5 Nations main tournament, the rank of the team rose to 55th as they are about to be joining the best of all the Asian teams in 2013. In 1998 the Philippine Rugby Football Union (PRFU), the national governing body for rugby union in the Philippines, was formed. Rugby union in the Philippines was introduced mainly through the large number of British, Australian and New Zealand expatriates living in the country. The Philippines made their first official international debut at the 5th division of the 2006 ARFU Asian Rugby Series. They won over Guam, 18 – 14, in its first match in May 20, 2006 but was later defeated by Pakistan in a match held in June 11, 2006 and failed to secure the sole slot for promotion to the next division. In December 2006, the Philippines Under-19 went undefeated in the Asian Rugby Football Union (ARFU) Under-19 Second Division Tournament. In 2008, the PRFU gained full membership to the international governing body, the International Rugby Board (IRB). The Philippines dominated the fourth-tier of the ARFU Asian 5 Nations Series and captured the inaugural Division 4 title. During the tournament, the Philippines demolished Brunei 101-0 and then defeated the home side Guam 20-8 to capture the division title. 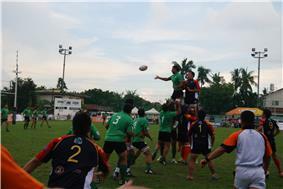 In 2009 the Philippines won the inaugural Asian 5 Nations Division III rugby tournament at the Nomads field in Parañaque City. Defeating Iran 15-0 and Guam 25-0 in their two matches, the Philippines were then promoted to the Asian Five Nations Division II rugby tournament. In 2010 the Philippines competed in the Asian 5 Nations Division II tournament and won it beating India in the final on a score of 44-12. Also in 2010 they played in ARFU Rugby 7s tournaments in Shanghai, Borneo and the Asian Games in Guangzhou. In 2012 the Philippines competed in the Asian 5 Nations Division I tournament and went unbeaten in the round-robin series against Singapore, Chinese Taipei and Sri Lanka, therefore qualifying for the main division for the first time. The Volcanoes suffered heavy defeats in the 2013 edition of A5N, however showed good signs with a competitive first half against Hong Kong in Manila, and a win to avoid relegations against UAE also in Manila. The Philippines national rugby union team is nicknamed the 'Volcanoes'. The name comes from the 1st Filipino Infantry Regiment that fought under the command of the United States Army. It was made up of Filipino-Americans with a few Filipino veterans which fought in World War II. The PRFU thought the situation was similar to the first Philippines national team which mainly consisted of foreign expatriates with only a few Filipinos. 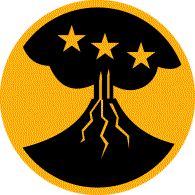 The emblem of the team is based on the insignia of the 1st Filipino Infantry Regiment. One of its features is a volcano which represents where the infantry units were located. The Philippines vs Iran, 2009 Asian Five Nations Division 3 Semifinal. The following was the 23-man squad for the 2013 Asian Five Nations match against Japan. Last updated after Philippines vs Japan March 20, 2013. Statistics include officially capped matches only. ^ "IRB World Rankings - 16 April 2012". ^ "Philippines to join Asia's elite in 2013". RugbyWorldCup.com. April 21, 2012. Retrieved April 23, 2012. ^ "Trio on rise after RWC 2015 qualifier wins". rugbyworldcup.com. International Rugby Board. Retrieved 23 April 2012. ^ David, Greg (21 May 2006). "spacer.png, 0 kB Philippines take First International scalp". Philippine Rugby Football Union. Retrieved 10 June 2015. ^ Scott, Jamie; Gallagher, Jarrad (14 June 2006). "Pakistan finish Asia Nations Series with win". Philippine Rugby Football Union. Retrieved 10 June 2015. ^ Fopalan, Reneé. "Mission accomplished: PHL Volcanoes erupt at Asia 5 Nations, beat Sri Lanka". GMANetwork.com. GMA Network. Retrieved 21 April 2012. 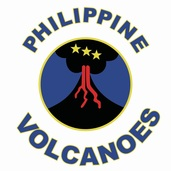 ^ "Welcom to the Philippine Volcanoes' blog!". Team Philippine Volcanoes. 2011-09-23. Retrieved 2012-04-15. ^ "California and Second World War - California's Filipino Infantry". MilitaryMuseum.org. Retrieved 2012-04-15. ^ "Philippines - head to head summary". Rugby Data. Retrieved 2011-03-17. ^ "Philippine team named for A5N match against Japan". Philippine Rugby Football Union. 2013-04-18. Retrieved 2013-04-19.